In April, Kenton Brothers team members attended the largest physical security convention in the Americas called ISC West. Our team, along with 30,000 other attendees explored over 1,000 exhibits, and over a hundred classes and workshops. Each year, ISC West allows us to continue our education, find out what is changing, and keep up to date on the latest technologies in the physical security space. This year several technologies made impressive advances and we had a front row seat to their unveiling. Artificial intelligence and analytics are making huge strides right now. The easiest way to explain this is to think of all the data that is gathered by video cameras and intrusion detection systems, then push it through a digital brain that looks for specific patterns. This brain actually learns and identifies patterns, and then triggers alarms or alerts that can be acted upon. This is called deep learning. 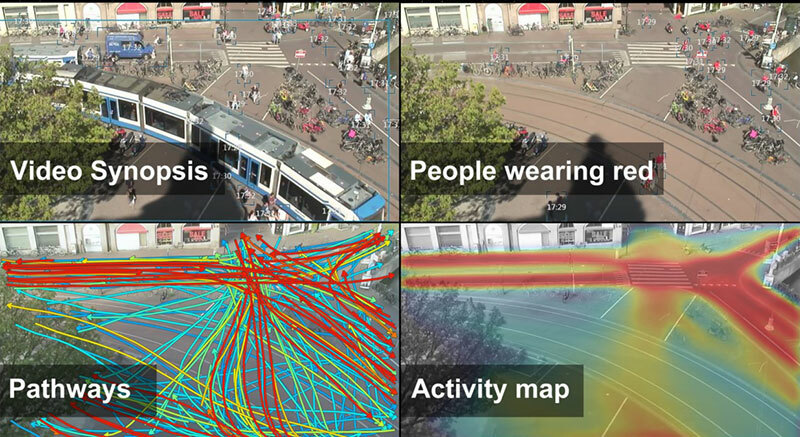 Briefcam, a company that is developing this capability rapidly, had a very impressive show and we’re excited to bring this new technology to our customers. Yes Robots! They were everywhere at the show. The idea of robots small and large is to supplement your physical security patrolling options. Knightscope offers a 400 pound mobile robot that patrols like a security guard. It can also use analytics and sensors to test the environment for movement, gasses or other anomalies. Once detected, these alerts are passed on to a human in a central station that can interpret and act on these items in real time. Drones have become common in daily life. You can’t go to a public event and not see one in the air. Drones do a lot of good, but also present a real problem for secure spaces and crowds. This aerial platform is one of the largest issues faced by critical infrastructure and secure spaces such as power plants, water sources, prisons and entertainment venues. 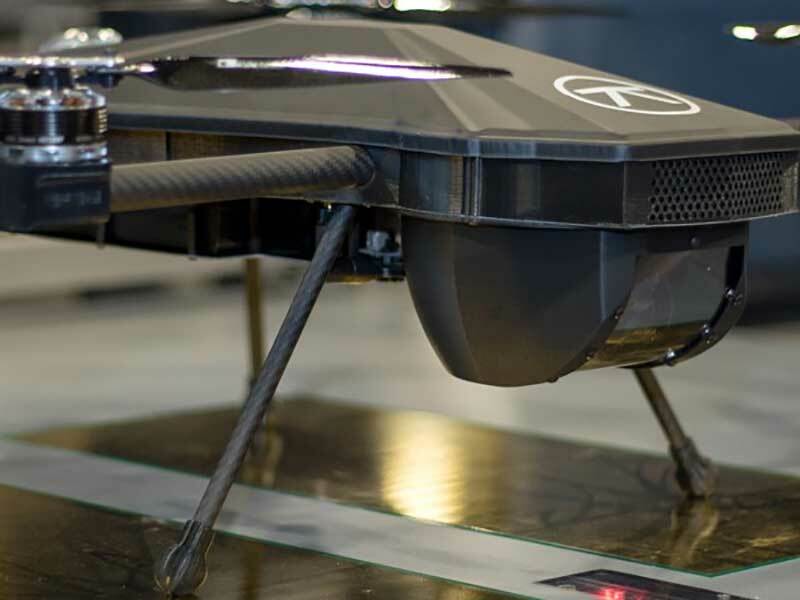 Several companies have developed unique ways to secure spaces from drone intrusion. 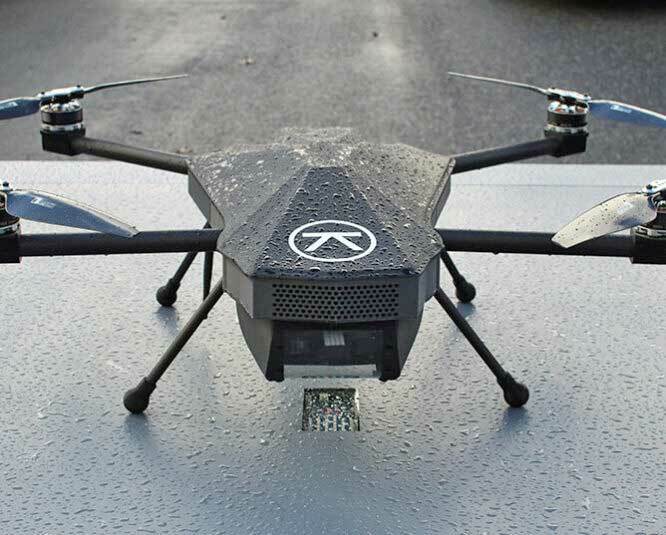 They are also developing new capabilities for law enforcement to use drones to help protect the general public. 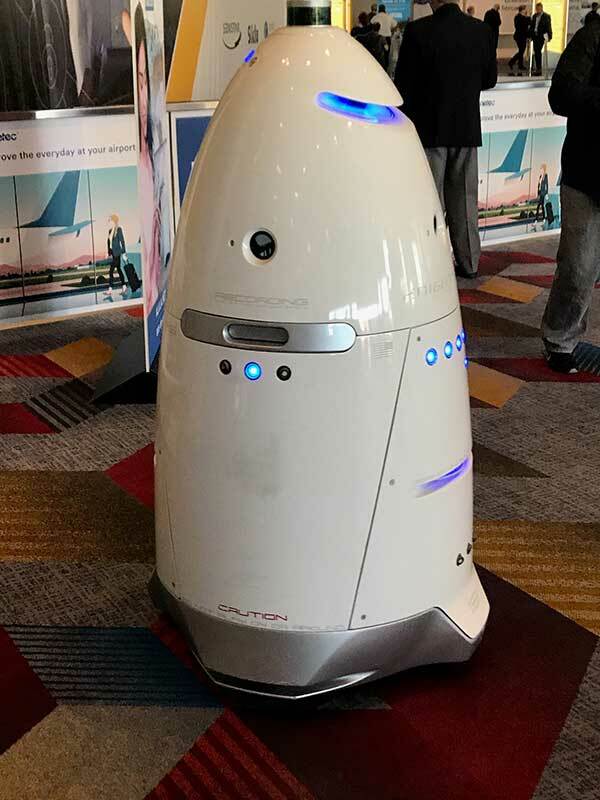 This has become such a large scale item that ISC West created its own portion of the convention called the Unmanned Security and Safety Expo. One of the best things about Kenton Brothers is our legacy of locksmithing. It has been our foundation since 1897, so we’ve learned a few things along the way. 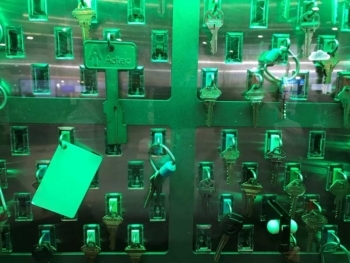 One of them is that an organized key system is an effective key system. Tracking who has them and when they’re issued and returned is pivotal to the security of a building. We’re happy to report that several companies are still investing in updating these key tracking systems and developing integrations with access control software platforms like S2. Yes Radar! New federal regulations in critical infrastructure protection require an almost 100% threat detection capability. There is no acceptable level of failure to detect intrusion into a system that could affect thousands or millions of people. 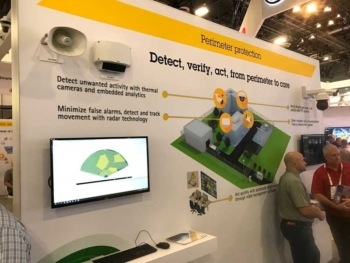 One of our strongest partners, Axis Communications, introduced their new radar system that works in conjunction with video analytics and thermal cameras to deliver near perfect perimeter detection capabilities. We’re very excited to see this technology perfected and offered on this scale. All in all, the 2018 ISC West Security Conference was very beneficial. We look forward to helping our customers take advantage of these new technologies for protecting their people, property and possessions. 5 Critical Things You Must Do In An Active Shooter Situation. At Kenton Brothers, one of our core values is Continuous Learning. So when presented with the chance to attend classes or conferences, we feel like it’s a great investment for not only ourselves but our customers too. I had the opportunity to attend the Active Shooter seminar “Dealing with Active Shooters” at ISC West in Las Vegas in April. I honestly didn’t know what to expect beforehand, but the topic is one that many of our customers worry about every day. The class was fantastic. The instructor was knowledgeable and had real world experience dealing with these situations. 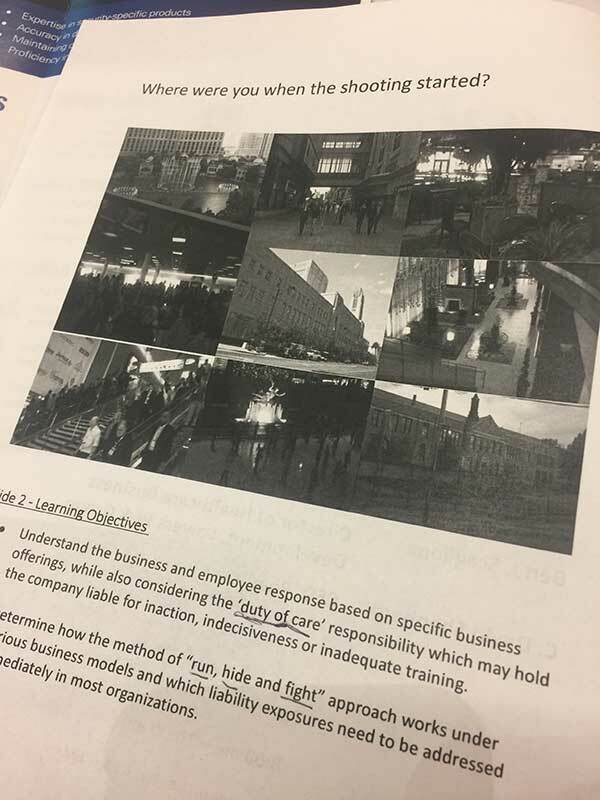 I wanted to share my takeaways and give you some resources for planning your company’s response to this type of situation. First, let’s talk about what you can do now, before an active shooter event happens. The advice shared is to have situational awareness at all times. Look for the things that are out of place and that your gut tells you are weird. These feelings are usually the first indicator that things could go wrong. Trust your gut. If you have a bad feeling… take steps to determine why. If you see someone approaching with a crazy look on their face, there’s a good chance they’re not trying to invite you to cocktails. Ready yourself or get out before there is a chance for violence. During the class, the recommended process for active shooter response is RUN, HIDE, FIGHT. However, their instruction went beyond those steps. For instance, you can run, but where to? There are only two directions to go, toward the violence or away from it. How sure are you that you’re are headed in the right direction? C. David Shepherd, former FBI and SWAT Member, boiled the process down to 5 things. Determine the Threat. Is it a person with a gun, multiple people with guns? Is it a person with a knife or chemical? Again, trust your gut and let all of your senses help you. Can you hear people screaming? Can you hear gunshots? Can you see smoke or smell it? Many times in these scenarios, it may take up to 30-45 seconds for someone to react because it takes time to process what is going on. Shortening this time could be critical for survival. Determine your distance from the threat. Where is this violence at? Is it in the next office? Is it in the lobby? Where are you in relationship to it? How long will it take for it to get to you? What is between you and it? Knowing this is critical because you don’t want to flee toward the violence. Is it better to bunker in place? Determine your quickest way to escape. What is the quickest way away from the violence? Could it be the stairs? Backdoor? What about the window? You must also take into consideration the following items: Who is with me, who do I have a duty of care to? Employees, Family members, patients, etc. How quickly can I get myself and those I am responsible for to safety?This can be greatly affected with prior planning. Take the time to notice the exits at the theater or hospital or even your office. If you can’t get out – bunker down or Hide. Lock doors, turn off lights, barricade doors stay away from windows and stay very quiet. Determine your ability to defend yourself. What are your skills and training? What is available around you to use as a defensive weapon? During the class, we spoke at length about different items such as concealed weapons, mace, pepper spray and even fire extinguishers. A fire extinguisher can be used as a “smoke screen” and a blunt instrument. Don’t forget chairs too. The goal is to get away. You may be able to incapacitate the shooter long enough to save yourself and family. The biggest lesson is that you must commit to your actions. If you are going to defend yourself, do it with a survivors mentality. Response to Authority. If you see police, immediately put your hands on your head and comply 100%. They will not know if you are the threat or an innocent. All of those details will be worked out later. Trust the process and follow directions. These 5 tips will help in an active shooter or mass violence situation. I want to stress how important it is to have a plan. Not only for preventing and managing the situation, but how you will respond after a tragedy of this type effects your organization. Kenton Brothers can help guide you through this process. Give us a call. https://kentonbrothers.com/wp-content/uploads/2017/05/Active-Shooter-Course-featured.jpg 300 400 David Strickland https://kentonbrothers.com/wp-content/uploads/2017/10/Kenton-Brothers-Logo.jpg David Strickland2017-05-24 13:48:262018-02-06 09:17:395 Critical Things You Must Do In An Active Shooter Situation. 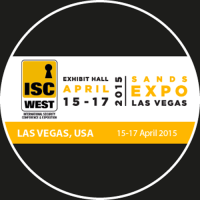 ISC West is the largest security conference in the United States. This year, over 1,000 vendors showed up at the venue. The amount of information as you walk into the show floor is overwhelming. The number of people is staggering. Among all the booths there are standouts of emerging technology that is really exciting for our industry. Today, I’d like to talk about a couple of things I saw at ISC West that are worth mentioning. As an IT guy, I get really excited when something really geeky comes out. Sometimes it’s very cool, but not practical. This year though a cool and useful trend is emerging, Deep Neural Network (DNN) Learning. This is a technology that allows a computer system to make educated guesses about something and then learn from its mistakes. Think of an infant learning to walk. They make lots of mistakes at first, but each try gets better and better until they no longer even think about it. Then they progress from walking to running and then jumping. DNN Learning is kind of the same process. We’re in the “learning to walk” phase, but it will only get better from here. Deep Neural Network Learning is the same technology that allowed Google to beat a human player in Go. In the world of security, DNN can learn the difference between the background image and a person in the foreground. One such camera that we saw was Umbo. The Umbo camera can alert on just parts of a body; in the demo, just a human hand set off the camera analytics. 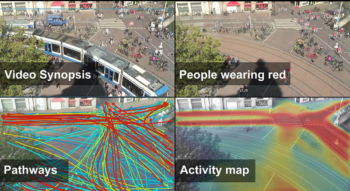 We saw many applications of DNN from computers being able to tell whether a person was young or old, boy or girl, wearing glasses or riding a bike or a Drone being able to track a vehicle as it’s driving through traffic. An entire section of the show was dedicated to unmanned technology. There were several new technologies using drones, both on the ground and in the air. Some companies like Nightingale Security are using air based drones to do tours of a facility to identify threats. Robotic Assistance Devices is doing tours with ground-based drones. Then there’s a whole section of the drone sector dedicated to anti-drone technology. Drone Shield and Dedrone are two such companies that have unique ways of detecting drones. Disabling or jamming un-authorized drones seem like the next logical step after detection and there are some technologies out there already, but current laws don’t allow for easy application of the technology. I’ve not been able to evaluate these companies yet, but I’m excited to see the new technology becoming available. 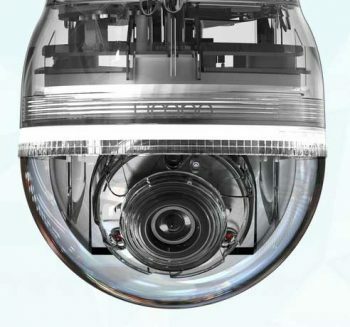 It will be an interesting few years to see how much smarter our cameras and control systems are going to become. I believe that we witnessing the next major leap of camera technology! Kenton Brothers Systems for Security attended ISC West last week in Las Vegas, NV. The largest security event in the United States, ISC West hosts over 1,000 venders and security experts sharing the latest in products and training with security integrators from all over the country. As technology improves, physical security continues to become more integrated, more portable, and more secure. Kenton Brothers Systems for Security is dedicated to providing the latest in security solutions to the Kansas City area and beyond. Please enjoy this video recap of the show, then contact Kenton Brothers for a complimentary security evaluation. 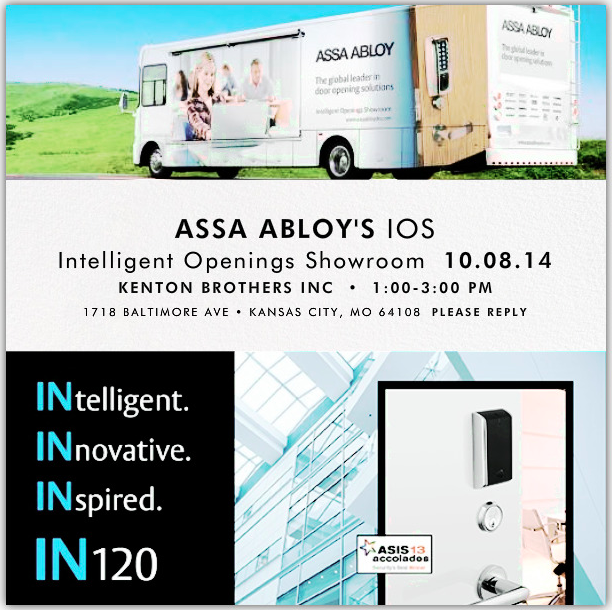 Typically, when one of the Assa Abloy mobile showroom’s is in the lot at Kenton Brothers you smell BBQ in the air, feel the first heat of Summer, and see customer’s being appreciated under our tent. This year our customer’s are getting a special, added bonus visit from the Assa guys–a 2nd mobile showroom–where you will discover how to implement locking solutions to provide the right level of security to protect specific assets behind each and every door! Offline locks and eCylinders with audit trail functions. Locks connecting to an IP network. Open-architecture integrated wiegand locks and strikes with 3rd party software. Campus security locks in offline, IP, and wifi configurations. Intelligent doorway components to connect, communicate, and relay continuous status to your security network. It’s bigger, sleeker, and has more innovative products than ever before. Such exciting things going on around Kenton Brothers Inc….mark your calendar’s for October 8th and join us at 1718 Baltimore Ave., Kansas City, Mo 64108!